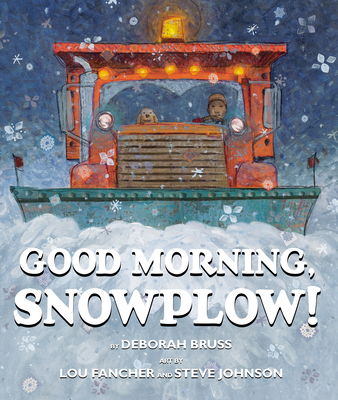 Deborah Bruss is the author Book! Book! Book!, published by Arthur A. Levine Books. As a child, Deborah did not enjoy writing, and even attempted to avoid writing-intensive classes in high school. She did not overcome her fear of writing until she reached college and began her career as an author when she was in her thirties. Deborah has worked as a substitute teacher and a school librarian. Her hobbies include traveling, sailing, swimming, adaptive skiing and singing with a female musical group, the Songweavers. Deborah lives in rural New Hampshire with her husband Michael, her sons Nathanial and Isaac, and her daughters Bayshay and Isatu. New York Times bestselling illustrators Steve Johnson and Lou Fancher have collaborated on over 45 picture books together. Their work has appeared in annual reports, advertisements, magazines, and movies, including Toy Story and A Bug’s Life, for which they provided pre-production set and character designs. No Star Nights was their first children’s book. Together, they have illustrated The Salamander Room by Anne Mazer; Felix Salten’s Bambi, adapted by Janet Schulman; Cat, You Better Come Home by Garrison Keillor; My Many Colored Days by Dr. Seuss; The Velveteen Rabbit abridged by Lou Fancher; and Amazing Peace by Maya Angelou. They have been recognized on the New York Times Best Illustrated Books list and are recipients of a gold medal from the Society of Illustrators. Steve and Lou live in Moraga, California.